As all PC gaming cat owners know, mice cables somehow possess the same tasty properties as the tails and innards of their real life counterparts. I don’t know what it is that’s so mouth-wateringly delicious about long, thin wires, but man alive did my cats like chewing them when they were little. Thankfully, they’ve largely grown out of their cable-munching phase (if only because they can no longer squeeze themselves round the back of my PC), but for those who have lost many a best gaming mouse to the jaws of our pets, help is at hand in the form of HP Omen’s metal-cabled Reactor mouse. Admittedly, it would have been nice if HP also had the foresight to bundle in some kind of cable tidy to help keep its 2m metal coil under control, but I’d like to see a cat try and sink their teeth into this pleasingly springy wire and come away victorious. Of course, the Reactor’s metal cable isn’t just for warding off ravenous pets. Its extra weight also helps the cable lie completely flat on your desk and its metal exterior prevents it from getting kinked as well, allowing you to move it around more easily when playing games. The only downside is that it does make the Reactor one of the heavier gaming mice I’ve used in recent months. Despite its somewhat svelte dimensions of 122x80x42mm, the Reactor comes in at a hefty 160g, with the bulk of that feeling like it’s coming from the front of the mouse where it connects to the cable. In truth, I didn’t actually find its weight to be that much of a bother during everyday use. Although I tend to prefer using mice nearer the 100g mark, the Reactor was surprisingly pleasant for gaming and desktop tasks alike, and it never once felt like I was having to heave it across my mouse mat. That’s probably because the rear section of the Reactor has effectively been hollowed out, which goes a long way in helping it feel lighter than it actually is. Turn the mouse on its side, for instance, and all you’ll see is a lovely red spring sitting beneath its height adjustable palm rest. The spring makes a pleasant change from other height adjustable mice I’ve seen in the past, such as the Acer Predator Cestus 510, as it means you don’t have to contend with fitting additional bits of plastic to the mouse, or indeed remembering where said bits are if you fancy a change. Instead, the Reactor has everything you need right there in the mouse itself, making it feel more high-end and convenient than its accessory-laden competitors. Indeed, push back the lock button on the right hand side of the mouse, and you can set the palm rest to sit at almost any angle you like. Fully extended, it comfortably supported my entire palm for when I was feeling lazy and just wanted to browse the web with it, while lower angles felt better for when I wanted to use a slightly more agile fingertip grip. Slide the lock button back and you can adjust the height of the palm rest to whatever angle you like. That said, I worry that those with larger hands may find the palm rest’s inner edge a bit grating at times, as trying to adopt a palm grip at lower angles started to irritate that fleshy bit between my thumb and forefinger. It’s not so sharp it’s going to cut into your hand and make you bleed a la Alec’s experience with the Logitech G603, but it’s a concern nonetheless – especially when I felt no such irritation when the palm rest was fully extended. 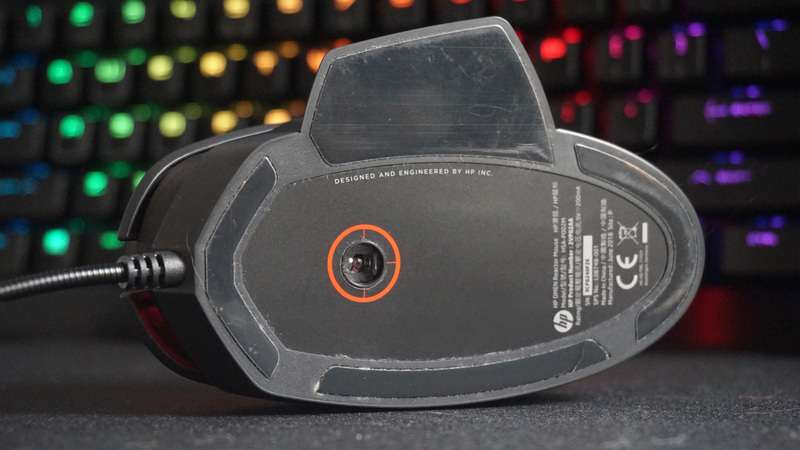 Still, as high-end gaming mice features go, I’d much rather shell out for something like this than the ability to add extra weights into the bottom of the mouse such as the Steelseries Rival 600 or Logitech G502 Hero. 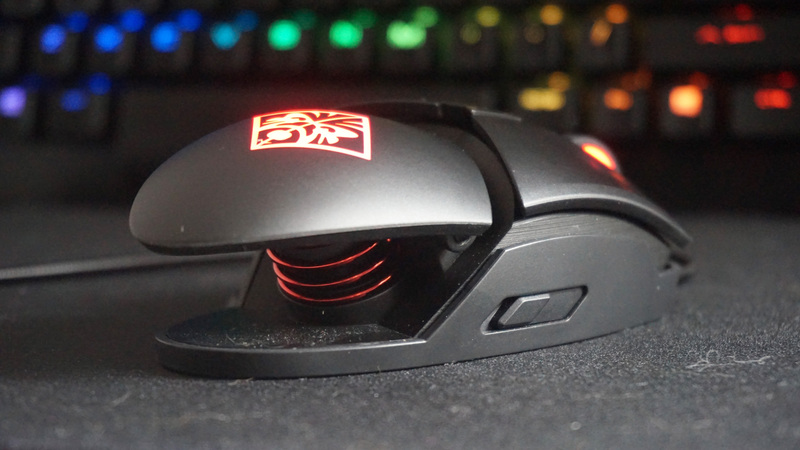 The Omen Reactor also has to be one of the quieter gaming mice I’ve tested in recent months, thanks to its optical mechanical switches. Instead of using lots of moving metal parts to register a click, HP have opted for light beam detection here, which they claim also makes the mouse’s response time up to three times quicker than traditional mechanical switches. Personally, I couldn’t see a jot of difference between HP’s super duper 0.2ms response time clickers and other regular ones, but then I’m not a whippersnapper esporter with reaction times that can be defined down to hundredths of a second. Instead, I just liked that they’re nice and easy on the ears, which can’t be said for every gaming mouse that crosses my desk. 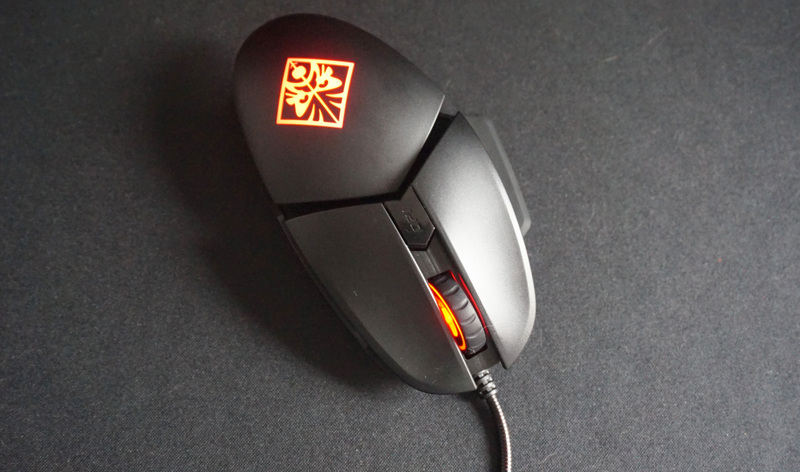 For all HP’s attention to the Omen Reactor’s physical details, however, the mouse still has some surprising omissions when it comes to its accompanying software. Its two side buttons, for instance, may be set to forward and backwards out of the box, but load up HP’s Omen Command Centre (which can only be downloaded via the official app on the Microsoft Store) and you’ll find a distinct lack of customisation options. Indeed, the only other thing you can assign to these buttons are recordable macro functions. Within that, you still admittedly get the option of setting up traditional keyboard shortcuts and launching applications alongside more game-orientated macros such as multi-key input sequences with customisable delay options and in-game text messaging, but that’s literally it. Media keys, extra DPI (or sensitivity) controls, even other mouse functions are all MIA at the moment, making the Omen Reactor much less practical than almost every other type of gaming mouse out there today. The same goes for its central DPI button. Whereas other mice will often let you set your own handful of DPI profiles, the Omen Reactor simply cycles up through 12 pre-defined speeds ranging from its lowest 400 DPI up to the maximum 16,000. That’s not at all useful if you want to go down a notch or jump between multiple speed settings at a time, and its colour-changing LED indicators are pretty much useless in actually identifying which DPI setting you’re currently on. It makes the Reactor feel oddly unaccommodating, and particularly ill-suited to competitive shooters, too, where you might want to drop the mouse’s DPI to trail someone down your sniper sights, for instance, before returning to normal to duck into cover. It’s a shame, really, as the Reactor’s physical flexibility is one of the things I liked most about it. To be let down by such limited software is a bit of a black mark in my books, and while it’s entirely possible HP may update their Command Centre with more options in the future, that doesn’t change the fact that, right now, this £70 / $80 gaming mouse has fewer customisation options than the £25 / $30 Steelseries Rival 110. 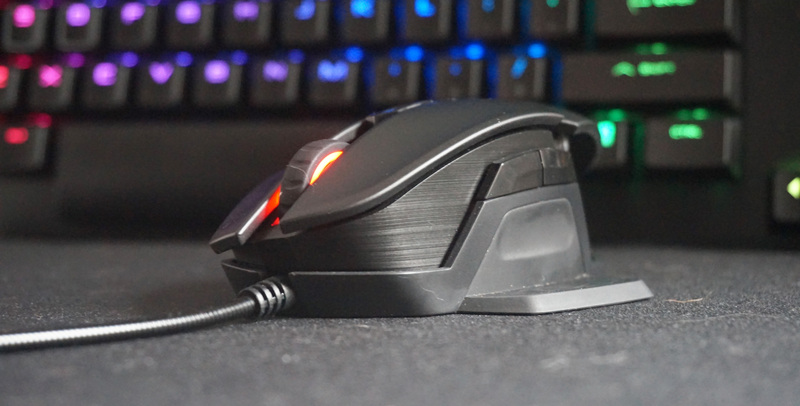 A lack of DPI and button options may not bother some, of course, but those after a truly premium gaming mouse will no doubt feel a sting of disappointment here. While there’s plenty to like about its overarching hardware, from its adjustable palm rest to cat-resistant metal cable, its lacklustre software prevents me from giving it a full seal of approval.